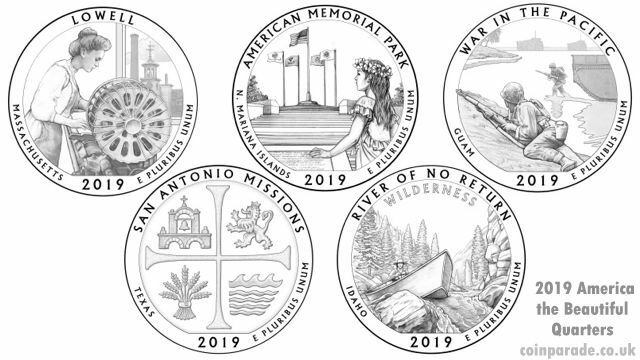 2019 America the Beautiful Quarters is part of the America the Beautiful Quarters® Silver Proof Set series and was the 10th set to be released. The US Mint launched the series in 2010 to commemorate the most cherished National Parks and other National sites. Each year 5 quarters of different designs are minted and released as both Proof and Uncirculated. The series consists of 56 coins and runs from 2010 until 2021 inclusive. Each obverse of the 2019 America the Beautiful Quarters shows John Flanagan’s 1932 portrait of George Washington. Each coin is 90% silver and weighs 6.25g with a diameter of 24.3mm (0.955 inches) and are available as Uncirculated or Proof. The edge is reeded. Coins are minted in either Philadelphia (P), Denver (D) or San Francisco (S). The park shows the importance of Lowell in the Industrial Revolution. 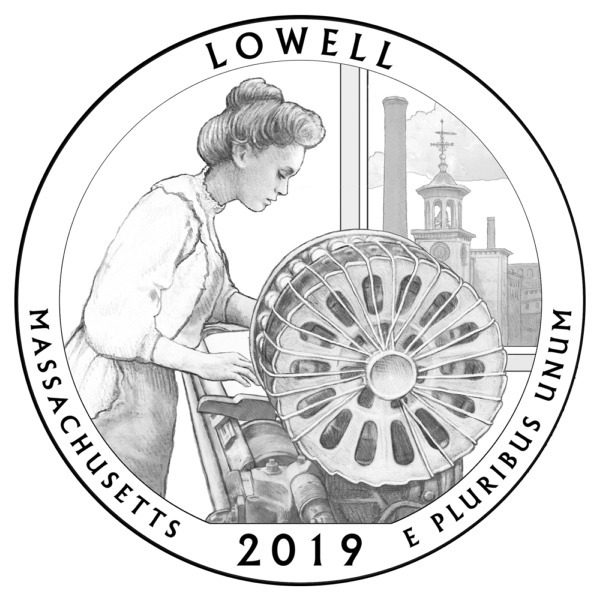 The coin design shows a mill girl, who would have earned cash wages and lived in supervised, company-owned boarding houses. She is working at a power loom with its prominent circular bobbin battery. A view of Lowell, including the Boott Mill clock tower, is seen through the window. 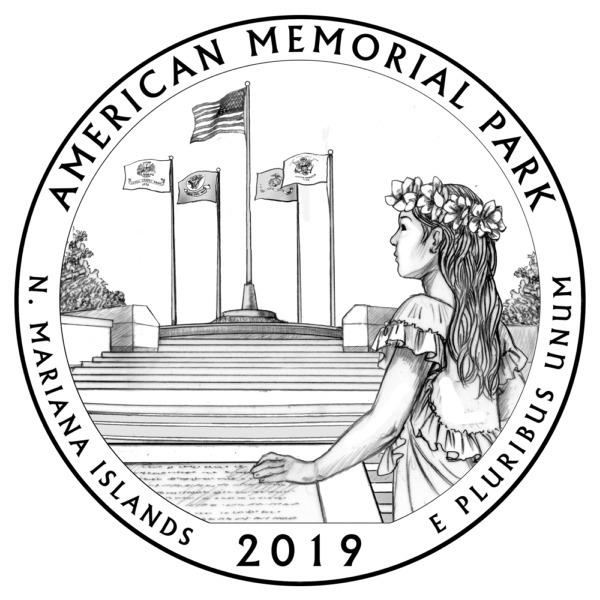 American Memorial Park in Northern Mariana Islands honors the thousands of American troops and local residents of Saipan who gave their lives during the Marianas Campaign of World War II. The Court of Honor consists of 26 granite panels inscribed with the names of 5,204 service members who died. 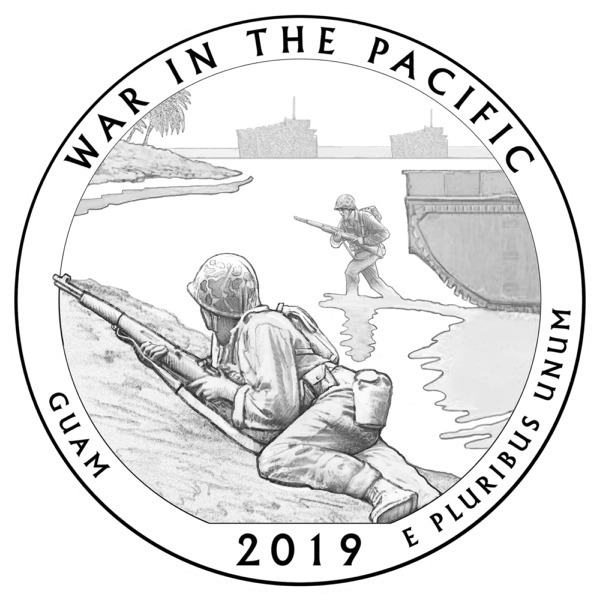 The reverse shows a young Chamorro woman in traditional dress at the front of the Flag Circle and Court of Honor; her hand rests on the plaque whose text honors the sacrifice of those who died in the liberation of Saipan. The park honors the bravery, courage, and sacrifice of those participating in the campaigns of the Pacific Theater during World War II. The park also conserves a variety of amazing resources found on the Island of Guam. This reverse shows American forces coming ashore at Asan Bay, strengthening the number of troops on the island in the fight for Guam and its eventual liberation. 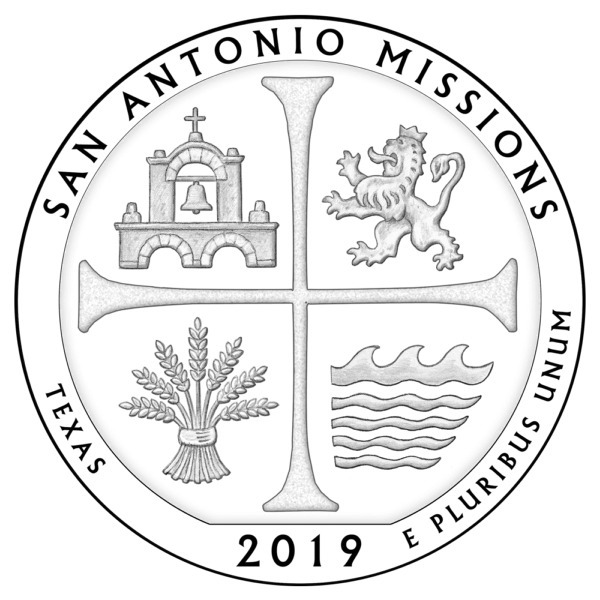 The San Antonio Missions were among the largest concentrations of Spanish missions in North America, established in the 1700s, and helped create the foundation for the City of San Antonio, TX. The reverse shows elements of the Spanish Colonial Real coin to pay tribute to the missions. Within the quadrants are symbols of the missions: wheat symbolizes farming; the arches and bell symbolize community; a lion represents Spanish cultural heritage; and a symbol of the San Antonio River represents irrigation methods and life-sustaining resources. The Frank Church River of No Return Wilderness in Idaho is made up of rugged mountains, deep canyons, and wild whitewater rivers, including the Main Salmon River and Middle Fork of the Salmon River. The name is in honor of late U.S. Senator Frank Church, who played a leading role in its preservation. 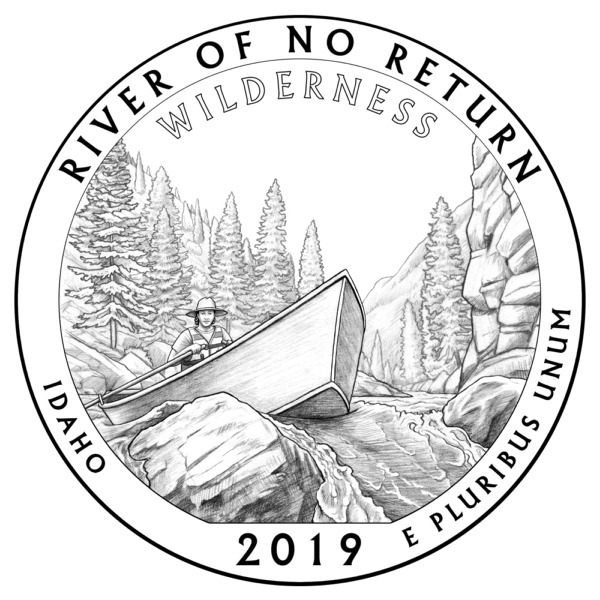 The coin shows a piloted drift boat on the rushing river encompassed by the trees and rock formations of the wilderness.